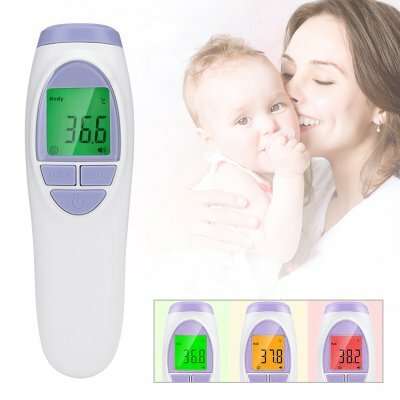 Successfully Added Non-Contact Infrared Body and Object Thermometer - 3 Color Backlit Display, High Fever Alarm, 5 Second Reading (Purple) to your Shopping Cart. Great for measuring the temperature of various objects: liquids, food, ambient temperature, etc. The non-contact infrared thermometer is a great tool for keeping your family healthy and is simply indispensible in a home with small children. The non-contact thermometer is a simple, quick, accurate and hygienic way to measure the temperature of people and objects. One of the main benefits of this model over contact thermometers is that the gadget does not need to come in tactile contact with the measured surface. This makes it perfect for use in a big family, as well as a school or kindergarten. The thermometer comes with a backlit display that will change color according to the measurement result: green means a temperature from 34 to 37.3°C and you have nothing to worry about; orange indicates 37.4 - 38.0°C and might be considered a warning sign for a looming cold and then you have red from 38.1 - 42.9°C that needs an urgent visit to the doctor or a request for a house call. In addition to measuring body temperature, the non-contact thermometer is great for measuring the temperature of liquids, food as well as ambient temperature. The Non-Contact Infrared Thermometer comes with a 12 months warranty, brought to you by the leader in electronic devices as well as wholesale infrared thermometers..